Burnley won three top flight games on the bounce for the first time since 1975 when Jack Cork haunted his former club in a 2-0 win against Swansea City. The Clarets achieved that feat four times during the 1974/75 campaign under Jimmy Adamson with the final of those, over December and January, bringing triumphs against Carlisle, QPR and Luton Town. 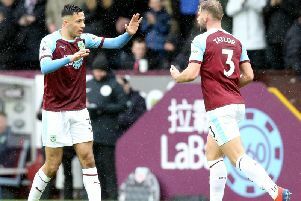 And it marked the first time that Sean Dyche's side had come out on top against the Swans in the Premier League as the home side completely dominated proceedings against their struggling opponents at Turf Moor. Aside from Matt Lowton almost finding his own net with a sliced volleyed clearance early on, the side from South Wales offered very little on their way to a sixth defeat in seven outings. From that moment in turned in to a very busy afternoon for goalkeeper Lukasz Fabianski who was called upon more times than he would have liked. The first time, however, was of his own making when his poor clearance fell to the feet of Steven Defour but the Polish international stopper raced back in to position to collect the midfielder's attempt. Defour was denied again when his stinging drive cannoned back off the chest of Fabianski before Swans skipper Federico Fernandez got across well to block Jeff Hendrick's rebound. City looked like a side trapped in a vicious cycle of miserable results and struggled to muster the fight to keep the Clarets at arm's length. Burnley's best chance before their opener fell to Ashley Barnes, who was given the nod over record signing Chris Wood and Sam Vokes with the pair having been on international duty. The striker was the first to react to Lowton's delivery, stealing a yard from Kyle Naughton at the far post, but his header was clawed off the line by Fabianski. The former Arsenal goalkeeper pulled off another save to thwart Johann Berg Gudmundsson but there was nothing he could do to prevent the hosts taking the lead in the 29th minute. Cork had been considered surplus to requirements by Paul Clement at the Liberty Stadium, with the likes of Roque Mesa, Sam Clucas and Renato Sanches brought in over the summer, but he highlighted that error of judgement with his second Premier League goal for the club. The England international, who scored against Spurs during a loan spell in 2010, couldn't really miss from Robbie Brady's peach of a cross but kept his cool to find the corner with a header. Burnley made it 2-0 just five minutes before the break as Barnes opened his account for the season. The striker, who last scored against Crystal Palace at Selhurst Park, took two touches from Hendrick's pass before smashing the ball past Fabianski from the edge of the box. The visitors had a chance at the end of the half to get back in the game but James Tarkowski, who has made more blocks than any other player in the division this season, added another to his collection when getting in the way of Martin Olsson's effort. Clement mixed things up in attack after the interval, replacing Jordan Ayew with Wilfried Bony, and the away side had more sightings of goal as a result, albeit without threatening Nick Pope. Hendrick went close to capitalising on a defensive calamity between Fernandez and Alfie Mawson early in the second half but, having anticipated the error in judgement, the Republic of Ireland international failed to get the elevation on his shot to beat Fabianski. Tammy Abraham had City's best opportunity of the game when peeling off the shoulder of Tarkowski to race on to Bony's through ball but the forward fluffed his lines. Bony should have also done better when Dyer's pull back was diverted in to his path by Ben Mee but the Ivorian failed to find the target. Swansea finally registered a shot on target in the penultimate minute of stoppage time, which hit six minutes, but Pope was equal to Bony's header from Olsson's cross to record his sixth clean sheet of the campaign. The Clarets now have 22 points from 12 games, just a solitary point shy of Spurs in fourth position.